Throughout this unit we not only reviewed trig but also learned new lessons. SOH CAH TOA can be rewritten as sin y/r, cos x/r and tan y/x. 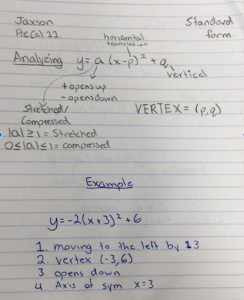 we learned reference angles, which I find are easiest to solve when using a visual, such as a graph. 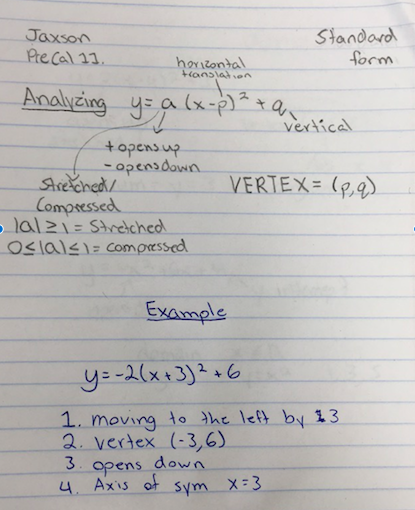 The reference angle is determined by the closet x-axis, this will help decide whether or not you add or subtract from the degree of each quadrant. we also learned the 2 special triangles. one we got by cutting a square in half and the other by cutting an equilateral triangle in half, these are used when we are asked for an exact ratio. I tried to post the picture but my edublog isn’t working, so I will email your the picture. 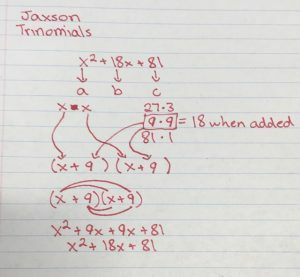 This week we were taught how to multiply ugly fractions, we were taught how to do this during grade 9 and 10, but this week we brought in a lot of new concepts. We were taught to eliminate some terms that were the same on top as they were on the bottom and we also learnt about many other tips. 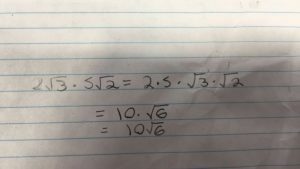 This week we were taught about reciprocals. 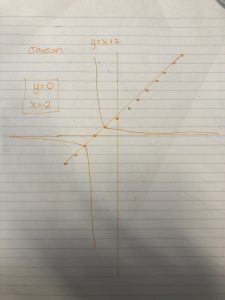 In this blog I will be teaching you how to draw reciprocals for a linear graph. 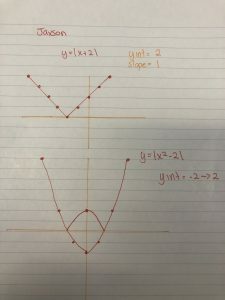 This week in Pre-Calc 11, we learned how to graph absolute values. 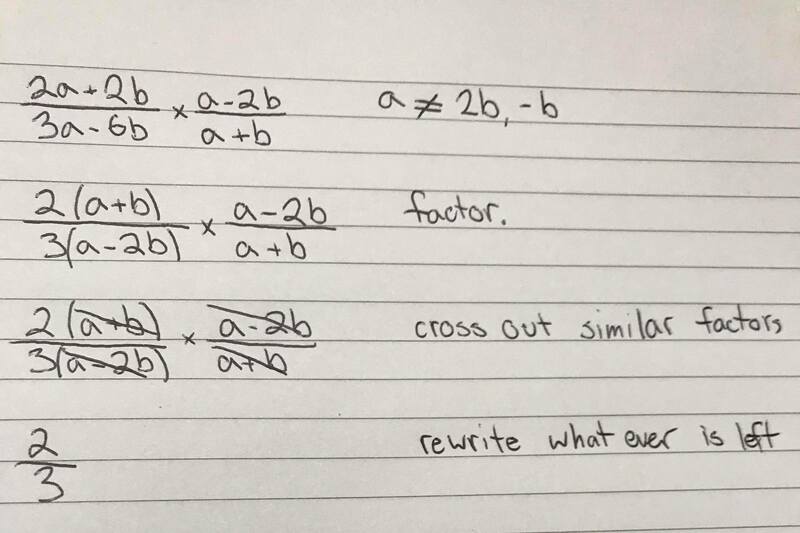 These can be applied to both linear and quadratic functions. 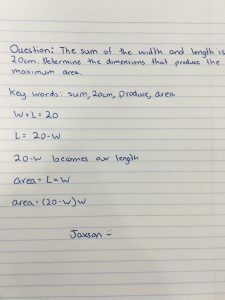 This task is very easy to complete. When graphing absolute values the quatratic or linear line will never go below the x intercept. 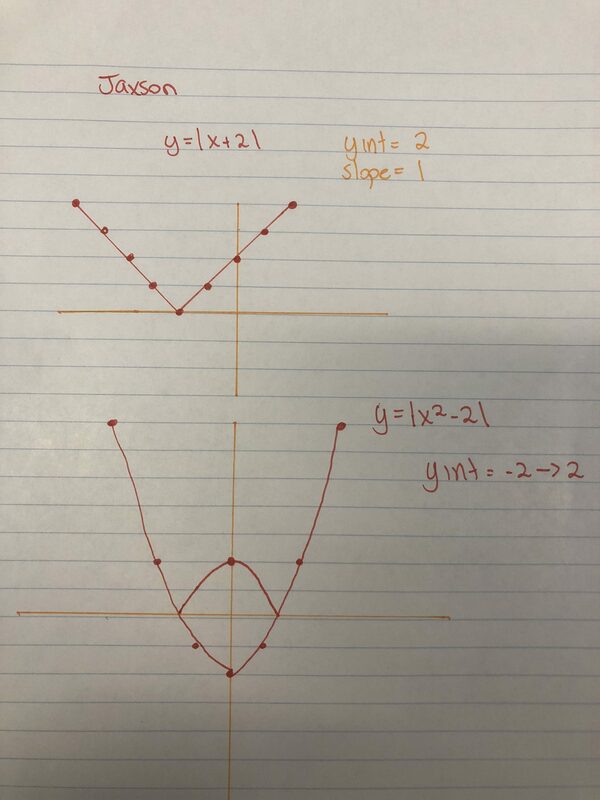 When the parabola has a absolute value it forms a W shape. This all happens because absolute value can never be a negative. This week we learned how to model using quadratic functions. 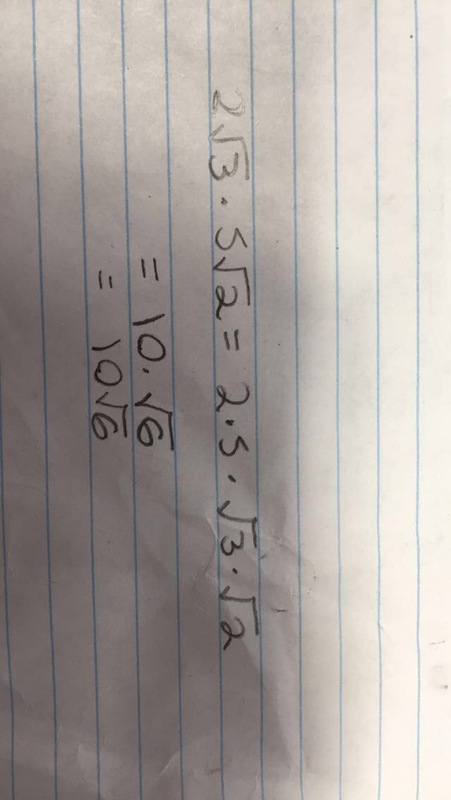 I struggled with this question because I had to force myself to look for the opportunity to use this way of solving. 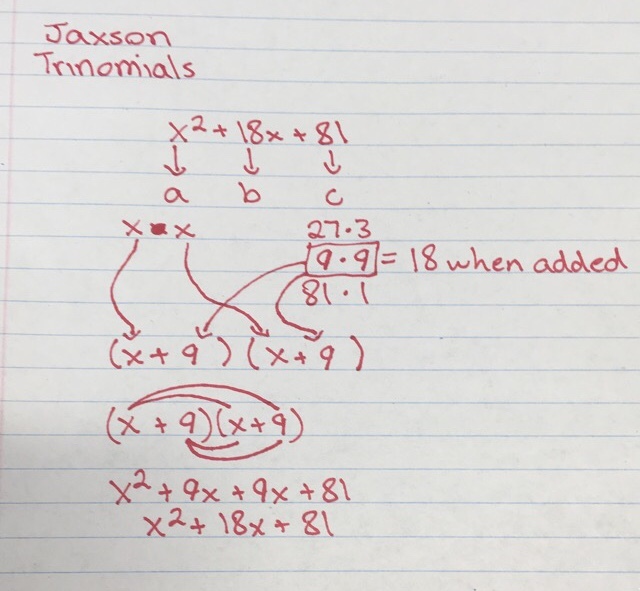 This week in pre-calc we learned how to factor using trinomials. There are a couple steps to figuring this out, but once you have figured it out it is very simple. 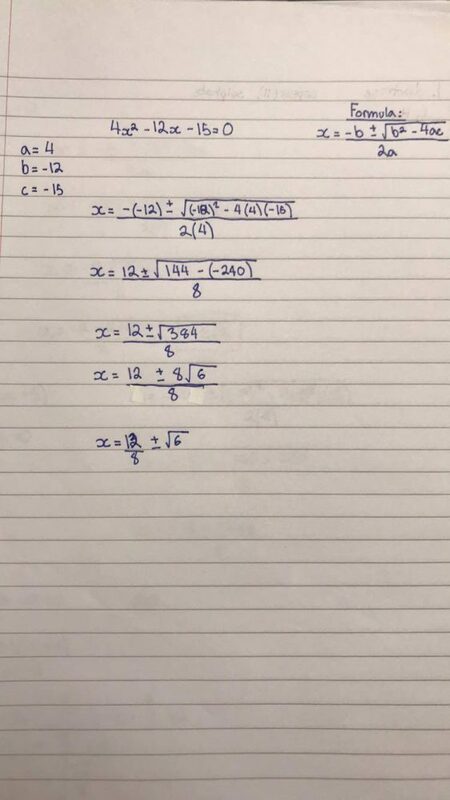 identify a,b, and c in the trinomial ax2+bx+c. 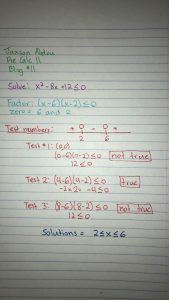 write down all factor pairs of c.
identify which factor pair from the previous step sums up to b. 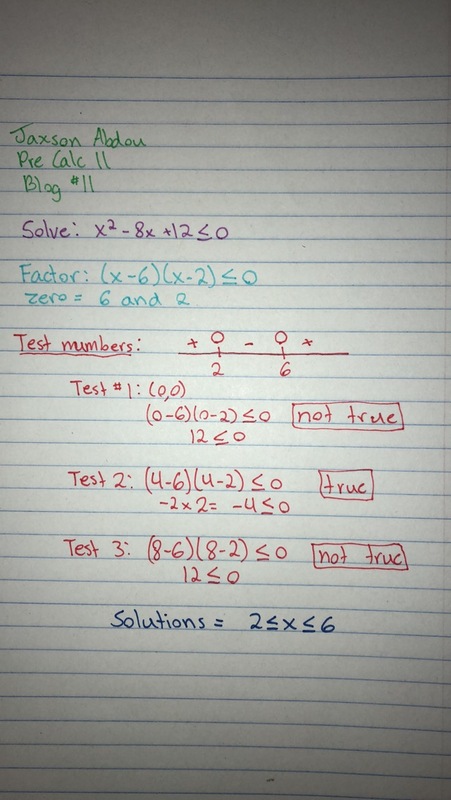 Substitute factor pairs into two binomials. 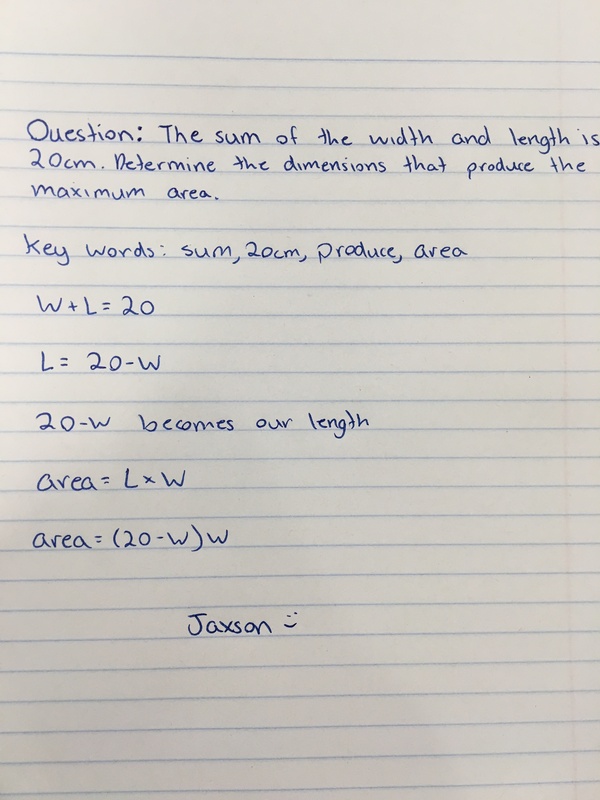 This week in Ms burtons pre calc class we learnt how do solve using the quadratic equation. This week we learned how to multiply radicals. 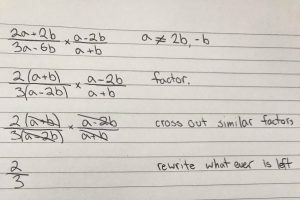 Multiplying radicals is very easy. JUST DO IT.